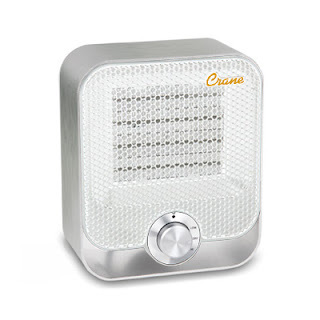 Crane's Ceramic Personal Heater is the perfect way to warm up this winter! Living in Arizona it doesn't really get too cold like it does in other places around the country or the world but this girl still thinks it gets cold enough to snuggle up next to a heater. In fact as I type this I've got this Ceramic Personal Heater keeping me nice and comfortable as I work because it's about 53 degrees outside. 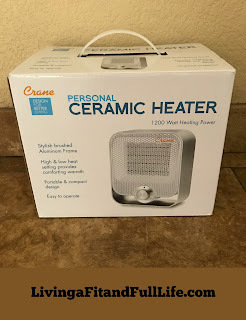 Crane's Ceramic Personal Heater is the perfect personal heater and would be perfect for taking to work so you can stay comfortably warm while you work. I absolutely love the sleek stunning appearance of Crane's Ceramic Personal Heater and that it comes in both black and white. I also love that it's whisper quiet and produces a wonderful amount of heat. If you're looking for the perfect way to stay warm and cozy this winter Crane's Ceramic Personal Heater is up for the job. It would also make a terrific Valentine's Day Gift! Click HERE to find a store near you that sells Crane products! Click HERE to learn more about Crane!